I’m a huge fan of the Parker novels and this is the one I’ve read most recently. For those who don’t know, Parker is a professional thief, and one who’s very good at what he does. The writing style is lean and mean and a lot happens in the stories. I’m working my way through the whole series in order, though I tend to read other things in between, so I can stretch them out a bit, as there are only so many. I discovered the novels after seeing the movie ‘Payback’ with Mel Gibson, which is one of my favourite films. I knew it was based on the movie ‘Point Blank’ which was based on the novel of the same name and so I was very interested in reading the book but at that time it wasn’t available. Some time after that I found that Quercus books was bringing out the latest books in the Parker series. The had been something like a 25 year gap, in which Donald E. Westlake, writing as Richard Stark, hadn’t written a Parker book but then brought him back. So the new stories where being published and were available in the UK. I read the first one, ‘Comeback’ and was hooked. Then ‘Point Blank’ was reissued by a different publisher and I finally got to read that too. The only trouble was there were only so many of the newer stories and I wanted more. Fortunately, the University of Chicago Press reissued the whole series – so I immediately got the whole lot. And ‘Deadly Edge’ is where I’m up to. I only have a few more to go in the original series and then I’ll carry on through the newer ones again. Once I’ve read those too? Well, I have loads of other books waiting to be read – but every once in a while I know I’ll definitely be revisiting Parker. 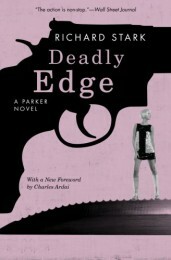 This entry was posted in Books and tagged Donald E. Westlake, Parker, Payback, Point Blank, Richard Stark by Amer Anwar. Bookmark the permalink.